比特幣懶人挖礦教學 – 瀏覽器全自動挖礦 (超簡單) 不挖嗎?? Our system has detected 12 free BitMiner V1.0 accounts on your IP address. You can only have 1 free account at a time! 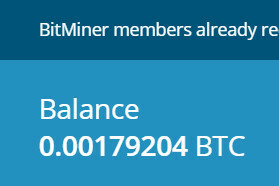 You need to Upgrade your BitMiner to make withdrawals. Withdrawals for premium accounts are not limited. “比特幣懶人挖礦教學 – 瀏覽器全自動挖礦 (超簡單) 不挖嗎? ?” 有 8 則迴響.